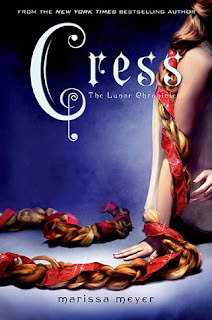 It's taken me more than two years to read Cress, and that's not for lack of wanting. I have such a horrible memory for series that I wanted to jump straight from Cress into Winter, the final book of The Lunar Chronicles. Now, this ended up backfiring rather spectacularly, since I managed, in the interim, to forget most of what happened in Scarlet (although, thankfully, Cinder remains quite clear). My advice would be to re-read the whole series as you're going along unless you have a prodigious memory. Cress is my least favorite out of the books in the series that I've read so far, but in no way does that mean I disliked it. I just loved it a little less than the others, that's all. Part of the issue may be that we're building up a rather large cast of characters, and in my own selfish way, I only want to read about Cinder, as she is still my favorite. Cress is a rather sprawling novel, with lots of subplots, but everything does come together very neatly at the end. Meyer also did a spectacular job integrating the original Rapunzel fairy tale with this post-apocalyptic cyborg sci-fi fantasy-o-rama. Cress is a Lunar, but she's also a Shell, which means that she doesn't have any of the mind powers that most Lunars do. She's useless, and should have been killed at birth. Except, she grew up in a camp for abandoned Shells instead, overseen by one of Queen Levana's head thaumaturges. Cress' aptitude for technology and hacking made her a worthwhile commodity, and soon she found herself imprisoned on a satellite, monitoring all Earthen communications for relay to Levana and the Lunar Throne. If you can imagine being imprisoned on a satellite for most of your life and abused by the only person who comes to visit you, well, then it's no surprise that Cress is sympathetic to Linh Cinder, the most wanted person on Earth and Luna. She contacts Cinder, along with Scarlet, Wolf, and Captain Thorne, and helps them hide from the authorities. Now, they're coming to rescue her. Except everything goes terribly wrong, as the best-laid intentions of mice, men, and androids so often do. Cress and Thorne are imprisoned on her satellite, Scarlet is captured and taken to Luna, while the others flee to Earth with the dual task of stopping the royal wedding and rescuing Scarlet. This is a nonstop action book, and although it's relatively long, you don't really notice it. That may be another reason why this wasn't my favorite; in Cinder, Meyer introduced us to Linh Cinder's way of life piece by piece. We saw her skills as a mechanic, her family woes, and her struggles with her identity as a cyborg. While the sci-fi aspect is strong, it's mostly a character-driven book. I just had a hard time, personally, moving to the full-on action DESERT CAMELS ASSASSINATIONS INFILTRATIONS DISGUISES FIGHTING! that is Cress. But once I figured out what was going on, I fell happily in love. You probably know by now that I adore action-packed books. Some people might criticize Cress because she's the polar opposite of Scarlet and Cinder. For pete's sake, you guys! She was raised on a satellite with regular visits from a psychopath. Her only solace was manipulating the net. Because of this, and what she has to do after leaving the satellite, she experiences the most personal growth. And come on--how can Thorne not fall for her? I mean, I'm pretty much in love with him, and I don't fall for guys easily. To go on would be to ruin the story for all of you, so stop reading this and go get The Lunar Chronicles and read those instead.